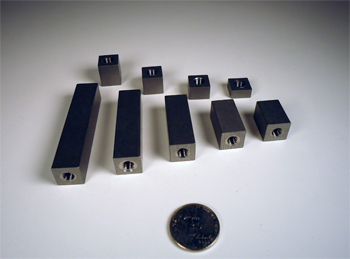 Our standoffs are all machined in-house at a tolerance of +/- .005". They are all cut to length on our cold saw then drilled and threaded using a high speed carbide drill and thread mill for maximum efficiency and checked with go/no-go plug gauges to ensure quality. If you have special requests for size, length, thread size or material we are happy to get you what you need. Some common special orders we provide are coarse threads, metric threads, blank standoffs and 316L stainless standoffs.